Do you love solving crossword puzzles? Do you love word jumble games that require you to unscramble jumbled words? Then Xanagram is the game for you! 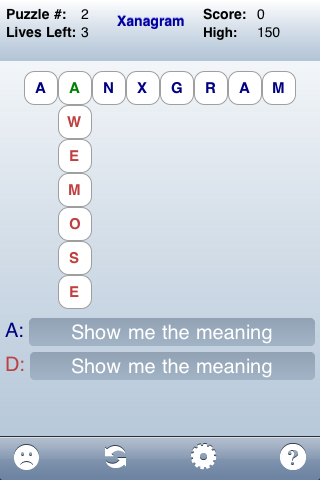 Xanagram displays a puzzle with two words whose letters have been scrambled. You solve the puzzle by unscrambling both words. To unscramble a word, rearrange the letters in the words by touching on a letter and dragging it over to its correct position within the word. When the puzzle is solved, and you move on to the next puzzle in the game. Xanagram Lite is the free version of Xanagram.